In recent years, the method of polarized luminescence (PL) has become one of the most valuable methods for the study of macromolecules. It provides detailed information on micro-Brownian motion in polymer chains which is related to various features of the structures and conformational properties of macromolecules. This review considers the use of PL in the investigation of macromolecules with covalently bonded luminescent markers (LM). This approach is very fruitful in the study of problems of physics and chemistry associated with changes in intra- and inter-macromolecular interactions, structural and conformational transformations in macromolecules and complex polymer systems, relationships between the reactivity of macromolecules and their intramolecular mobility, etc. The PL method is based on the study of polarization and other parameters of light emitted by luminescent groups (LM) covalently bonded to some parts of the macromolecules or polymer systems. 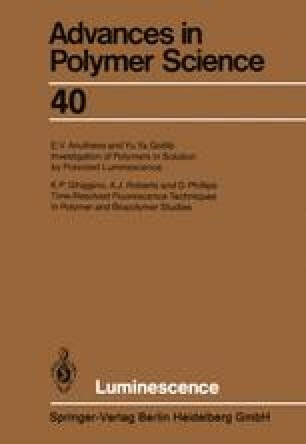 The PL method can be widely and systematically used for the study of polymers and polymer systems of various classes if it is based on specifically developed methods of covalent bonding of LM to the macromolecules of the polymers investigated. The structure and optical properties of luminescent groups, their amount and type of bonding to the polymer chain should meet certain requirements. Moreover, LM should not effect the investigated properties of macromolecules.